In this post, we’ll explore some of the common symptoms of the “beginner zone trap”, and why you might end up there. If you’ve found your progress has stagnated a little, and you are around an intermediate level, you’ll find actionable tips and study techniques to help you advance and break out of the beginner zone. You are reasonably good at vocabulary, grammar, and all the “study points” of Spanish. You can express yourself, but it’s an enormous effort and you feel a little embarrassed. You’ve tried “native level” materials, and found they may as well be speaking Japanese. Your motivation is starting to wane, and you are considering giving up. 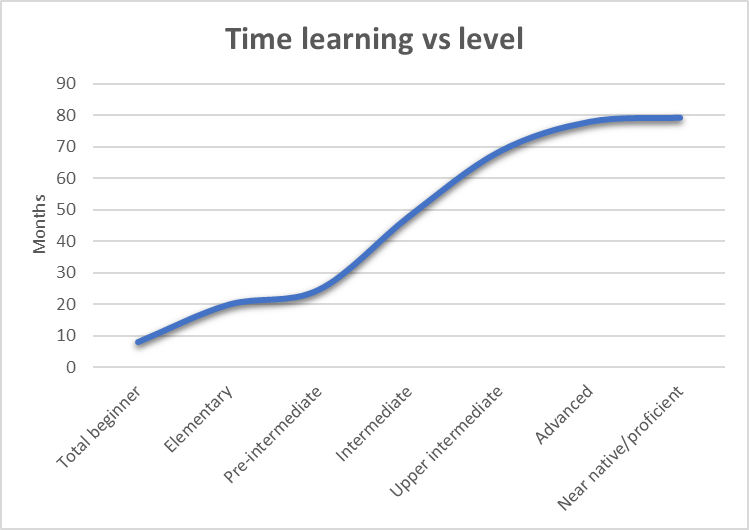 People progress quickly from beginner to pre-intermediate (in about 10 months), but to get up to intermediate takes 20-30 months of study. Many people get stuck at the pre-intermediate level, and never make it beyond. Why are you getting stuck? The answer’s actually very simple. In order to move out of beginner zone, you need to stop studying like a beginner. Simply put, you need to behave like someone who already speaks the language. If you continue prioritising beginner study methods, you’re likely to stay at that level. That’s not to say there isn’t a place for using flashcards, or learning grammar rules, but in order to progress your outlook of the language needs to fundamentally change. Sounds good, but how do we do it? I’ll share a story to show how this worked for me. I lived in Spain for two years. I went in a beginner, and came out fluent. I know the pain and frustrations that learning a language involves, but comprehensible input was the single most important thing that improved my Spanish over that time. I knew that flashcards and grammar books would only get me so far. They were helpful, but realistically started to give diminishing returns, and I found study boring and a chore. I knew I needed input to stimulate me. However, I started out with native level materials. I switched on the TV, and was met with a barrage of 100mph Spanish (Spaniards can speak really quick!). Disheartened, I headed to a bookstore, and picked up a worthy-looking tome. Bad idea. I could barely get beyond the first page before I wanted to bang my head against the wall in frustration. I started with materials that were way beyond my level, and as a result was frustrated. At that age, kids don’t know or care whether you speak their language. Luckily, they don’t tend to speak like news-readers or academics, so the Spanish I was exposed to was just right for my level. I learned more in 2 weeks with those 5 year olds than I did in 3 months of classes! I had stumbled upon comprehensible input. Comprehensible input (or rather, the “Input Hypothesis”) is one of a set of theories proposed by linguist Stephen Krashen in the 70s and 80s. It’s the idea that we learn best through “acquiring” language, and that happens when we consume content that is “comprehensible”, but also stretches us (otherwise we are just practising what we already know). We should aim for language that is understandable for the most part, but also introduces challenges. Go for material that’s too advanced and you’ll get frustrated; material that’s too easy won’t help you learn anything new. A central part of Krashen’s theory was that the emotions involved in your input also have an impact on your ability to pick up the language (this is known as the “affective filter”). For the best results, look to consume content in a relaxed, low pressure situation. Having to give a speech in a foreign language is an example of a high pressure situation (and if you’ve ever been in this situation you’ll know how much harder it is to speak); relaxing on your sofa with a book is about as low pressure as you can get, and will do more for your language skills. Volume is key: the more the better. Make a commitment to get into a daily habit of listening, reading, and generally consuming something in Spanish. Experiment with different materials. The goal is to be focused on the message, rather than the language. Some materials may work better for you – obviously we are a big fan of podcasts, but try experimenting with different formats and levels. Try to relax. This approach will stretch your comprehension, but if you obsess over understanding everything and look up every single word and phrase, you miss out on the benefits. Better to spend that time listening to yet more material! There is still a place for flashcards, grammar books, and other “beginner materials”, but make sure that you use them as a reference, rather than a starting point. However, this process will come about organically as a result of consuming the right level of comprehensible input – you shouldn’t have to force it. Once you find this combination, you’ll surprise yourself by just how quickly you’ll see improvements in your overall level of Spanish. How has your experience been with comprehensible input? Let us know your stories in the comments section below. PS – We are releasing a new intermediate series, and it’s our finest yet! Ensure you sign up as a member today to get early access.